Hundreds of thousands of FSU Jews of all ages and backgrounds took part in Passover events and activities organized by FJC communities and programs across eight countries with hundreds of cities, towns, and villages. Jewish youth and young adults program participants volunteered with the elderly, creating a sense of brotherhood and continuity; Jewish schools organized ‘training’ Seder nights to let the children get more familiar with the special night’s customs; communities welcomed everyone to matzah bakes while staying busy organizing public Seders, service, and programs in a way that would be accessible to every Jew in their region. 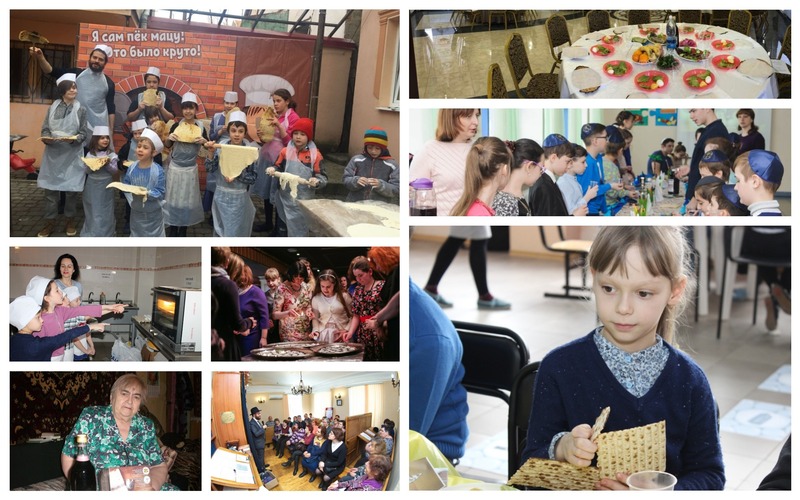 “On Passover night 170 Jews in Bryansk gathered to celebrate together at our community’s seder. For many of them this was the first seder experience of their lives,” said Rabbi Mendy Zaklas of Bryansk, Russia. In Tashkent, the capital of Uzbekistan, another 200 Jews came together for the night’s celebration, including visitors from Israel, the US and the UK. Additional country seders took place in the cities of Bukhara and Samarkand, with everyone receiving matzah packages and locally-made kosher wine. About 80 Jewish community members and tourists gathered in Bishkek, Kyrgyzstan for Passover night’s celebrations, also receiving all the products they needed for the holiday week. In Mariupol, East Ukraine the community saw a big rise in the number of participants, notwithstanding the volatile climate in the armed conflict borderline city. Meanwhile, in Birobidjan, the capital of the Jewish Autonomous region in the Far-East of Russia, Passover was celebrated as a national holiday. “We doubled the amount of Passover products that were sold and distributed. We held separate activities for students, for younger children, for adults, at different levels of interest and involvement,” said Rabbi Eli Riss, Birobidjan’s chief rabbi. “The seders were attended by the city mayor and government officials, highlighting the national character of the holiday in the region. Most of the communities had to make arrangements very early in advance to make sure they get the necessary products in time for the holiday. Passover product deliveries are a complicated affair in the FSU, as many regions do not have their own kosher food and have to have the products shipped from Israel or specially produced and delivered from more central locations. The EnerJew youth movement’s 40 cities each organized a Passover-themed event, some creating programming for the community, others partaking in the fun themselves. Darkeinu Jewish studies curriculum organized Passover trivia contest, Mega Passover, on a specially-dedicated website. “Children are given a special focus on Passover and we try to make sure this feeling transcends to FSU youth everywhere,” said Mrs. Sarah Vernick, Darkeinu informal education coordinator.